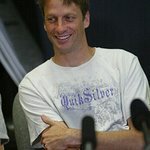 The world-famous skateboarder founded the Tony Hawk Foundation. Hawk has donated a signed skateboard deck to the Seany Foundation. Google trends for "Tony Hawk"